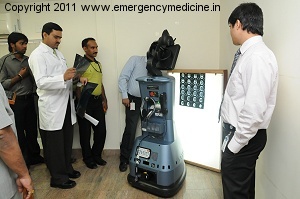 EmergencyMedicine.in - News: Robot Joins Emergency Department at Apollo Hyderabad! 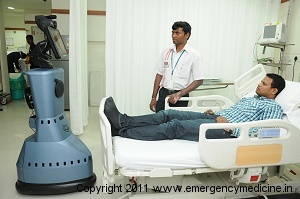 Robot Joins Emergency Department at Apollo Hyderabad! Has the War Against the Machines entered into our emergency departments?! Read on! Yesterday, Apollo Health City Hyderabad announced the launch of a Stroke Care Robot, technically known as RP-7 Remote Presence Robot. This machine is a mobile robotic platform that enables a physician to remotely monitor and guide treatment. The launch of this state-of-the-art technology was announced by Dr. Prathap Reddy, Chairman - Apollo Hospitals Group at a press conference on Saturday afternoon at Apollo Health City Hyderabad. This launch was aligned with the World Stroke Day. The RP-7 leverages wireless, internet and robotics technology to enable a physician to reach a the bedside of a patient, from a remote location. The robot removes time and distance barriers and effectively extends the physicians reach across countries. The RP-7, which is the first and only FDA cleared remote presence device, allows direct connection to medical devices such as electronic stethoscopes, ultrasound, etc, to transmit data to the remote physician. Under direct control of a remote physician seated at a control station, the RP-7 can move un-tethered allowing the physician to freely interact with the patient, family members, observe patient behaviour, check bedside monitors & ventilator settings, and pass treatment instructions to the doctors & nurses present. The stroke robot we are launching today will help us in reducing the neurologist response times for stroke victims. Earlier, better and more efficient care during the golden hour reduces morbidity and mortality in stroke. We believe that this technology will make a significant difference for stroke victims in the country, said Dr. Prathap C Reddy, Chairman - Apollo Hospitals Group. Image 1 - Dr. Sateesh, an emergency physician playing the role of a patient, shares a jovial moment with Dr. Rahul Khandelwal, Group Service Line Manager for Neurosciences, visible in the robot LCD. 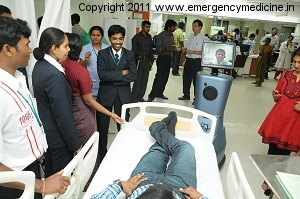 Image 2 & 3 - The Stroke Robot engages in a conversation with the simulated patient as the emergency department staff watch. Image 4 - The Stroke Robot looking at the CT scan films of the patient. 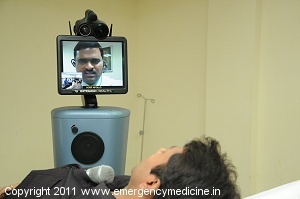 Image 5 - The remote neurologist talking to the patient in a demo session. Apollo Health City Hyderabad happens to be the first and only hospital in India to receive the Clinical Care Program Certification for Acute Stroke by the Joint Commission International (Go to JCI website). This certification, developed in collaboration with the American Stroke Association, recognizes centers that make exceptional efforts to foster better outcomes for stroke care. Apollo Hyderabad was certified in 2006 and recertified in 2009. Apollo stroke care clinical pathway closely involves ambulance drivers, EMTs, call center staff, emergency physicians & nurses, radiologists, neurologists & neurosurgeons, ICU staff and rehabilitation services, as well as, stroke clinical & administrative coordinators. The RP-7 also seems to be an exceptional machine. We watched it closely on how it was interacting with the simulated patients. It moved slowly and purposefully around the emergency department without disturbing other patients. It was being controlled via a laptop & joystick from another room away from the ED. Its machinery was completely silent. We also noticed that it had some kind of collision sensors all around it. The video on the LCD screen was quite clear. The most impressive was its audio system. It's directional microphone could hear the patient from a distance of 6 feet and its speaker was clearly heard by the patient. Both the patients got engaged in conversation with the remote neurologist within seconds, and forgot that they were actually talking to a robot. The neurologist managed to do a stroke assessment on them quite quickly. Apollo is planning to place this robot in one of its lower level hospitals where access to a neurologist is unavailable. Since this stroke robot is most likely to hang around in the emergency department waiting for stroke patients, we see its utility across the entire clinical emergency medicine field. A remotely located emergency physician can review seriously ill patients through the robot and guide their resuscitation/treatment plans. Bedside teaching of junior doctors & nurses will be a breeze. Counselling, conflict resolutions, etc, are all very much possible. Anyway, we will try to keep track of this robot and let you know what its upto. Maybe it will enroll itself for an EM residency training program! If the robot decides to replace all the neurologists of the hospital, then it is definitely War Against the Machines! Has robotics become popular in healthcare?